Our amazing black dj sound system theme will look absolutely wonderful on your BlackBerry handset! 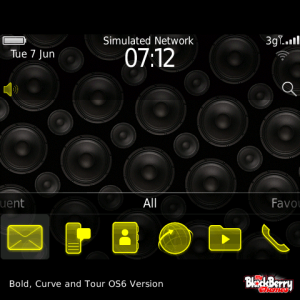 This theme comes with our amazing yellow icons which you will not find anywhere else on BlackBerry App World. Note: If your icons dont update after installing this theme, please reboot your phone by removing your battery and putting it back in again. Third party icons such as downloaded games, etc will retain their original color. Our themes are so easy to install – simply click to buy and the theme will download and open automatically on your BlackBerry. We hope your enjoy our amazing black dj sound system theme!